Sunday was slated for a nice long trail ride. With the temperatures finally livable again, I wanted to get around 15 miles in at a decent pace and headed off to Croft yet again (Croft is the closest to the barn at around 45 minutes). There were already several trailers in the lot when I arrived around 9 am. I debated on which trails to take and decided on my favorite long loop: head out the entrance road then dive into the woods on the right hand side, cross the river and meet up with the red loop I rode twice last weekend. That totals around 12 miles and then there is a small loop that comes off it where I could add 3 more if time was on my side. I had to be back by 3 pm for a Labor Day picnic. Everything started out really well. Gem was spooky, but settled down after about 2 miles and realizing that I wasn't messing around. We did a lot of halting nicely and not walking off until I said to and worked on being straighter as well. She acted like she was going to die when I made her trot an entire mile without being a dork about it until I reminded her that she cantered 34 miles before. Trotting 1 wasn't going to kill her. Then things went a little wonky. I haven't done the long loop in a really, really long time and had only done it twice total. I knew the creek crossing was a pain - it basically goes over a large rock that is covered in slick moss and then heads through the woods on the other side. There is no sign saying to turn into the creek, but if you go straight you end up reaching a NO HORSES sign. I saw an entrance to the creek that resembled my memory of it and had a good number of hoof prints leading down. There was even a picnic bench although I didn't recall that from before. I dismounted to lead her across the creek getting my shoes soaking wet in the process and letting her drink. The creek crossing is 4 miles into the ride with 2 left before hitting the red loop and my Garmin was pretty much saying that I was right. My toes are wet. Seriously? Across we went but then the trail petered out. There was a trail there if you squinted petty hard and almost made it up, but it was still there. I thought it was really odd that it had gotten so overgrown. Croft has great trails that are really well maintained and I did not recall running across a trail so poorly marked before. The trees were bare of markings as well, but I soldiered on anyhow on foot and then eventually mounted up again. I was just beginning to think about turning around when the trail came to a T intersection with a beautifully marked trail. Huh. I thought perhaps I had just missed something and turned left away from the creek and along our merry way. Except a mile later I realized I didn't recognize anything. There were large mountain bike jumps that I had never seen before and the trail was marked with a yellow rectangle. There were no hoof prints to be seen and I began to get really concerned. The yellow marking is used for the Palmetto Trail. This trail runs something like 250 miles through the entire state with some sections horse friendly and others not. It was most certainly not a loop and I began to worry that I might not end up anywhere close to my trailer. After another mile I finally turned back around. The trail was gorgeous and a lot of fun to ride on (I had come across a sign that confirmed horses were allowed) but then it hit me. The little trail I basically bush whacked in on would be near impossible to find again. The trail was so hard from the dry summer that Gem wasn't leaving prints either. For the first time I was really nervous. I've gotten "lost" a lot on trail but I could always back track where I came from. It may add a bunch of miles on, but I always knew I could make it back. But as I went along the trail staring hard at the woods to my right, I became increasingly worried that I would not be able to find it. A bridge I had not passed before which basically confirmed that I was unable to find my deer path. The miles ticked on by and I paced along the trail hoping to find my deer trail to no avail. Finally I came across two mountain bikers and asked where the trail ended up if I kept going the way I was (the direction they came from) and they told me Lake Johnson. I knew Lake Johnson and I knew it had a trail that connected back to the trail head eventually. I sent out an SOS to the hubby. He was oh so concerned. Gem's walk break was over and we moved into high gear to make up for lost time. The trail continued to be gorgeous and well maintained and we flew over it heading to familiar territory. Eventually it ended on a double wide dirt road that I had traveled on before and I made a right turn. Shortly after that I saw two signs: to my left it said barn 3 miles and to my right it said barn 6 miles. My Garmin read just over 7 miles and it was just shy of 12. If we pushed it, we could finish the 6 miles and be back for the picnic. Plus the 6 mile trail was the one I meant to take and this way I could go backwards and figure out where I went wrong. I made Gem fly over that trail keeping a 6 mph average and 2 miles later found the creek. Apparently I had just crossed it too soon by a tiny amount and that was where all the trouble started. Gem kept up the pace and we finished in good time completing 13 miles. She looked good at the end and now I have found a new trail I could take although I need to find the correct way to access it as I am sure my deer trail was not official. The real creek crossing. Much like the fake one I took, but deeper. I always enjoy getting lost when I know I'm not in a wilderness area! I always find new loops that way. Did it on purpose for most of high school and we never had to back track because we always managed to find a loop home. Definitely involved bushwacking at times, but so fun! Sounds like you had a great ride. I'm a very poor bush whacker. I stick to the trail 99.9% of my life whether hiking or riding. I am always paranoid about stepping in a hole or getting into a bog and getting myself or my horse hurt. It annoys Dusty to no end, but I just can't get comfy off the trail. Ha my sister and I did something like this while on foot on a camping trip. We thought we were on some sweet little loop trail but had apparently abutted the Appalachian trail and turned onto that instead. DEF not a loop! Glad you weren't lost too long! Oh no! You could have been hiking a very long time on that! 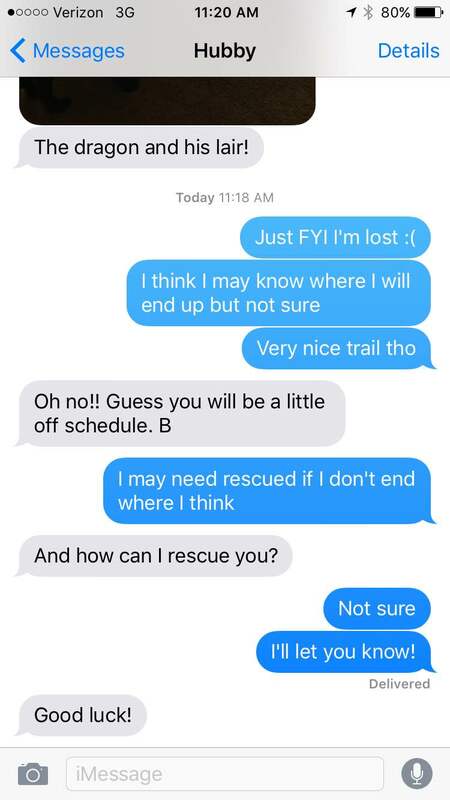 I love your husband's total concern about you being lost in the woods. It's good to see the bonnet out and about. Those trails do look nice and shady. I know, right? He was just like :hope you don't die out there, let me know!" I love the bonnet. Looking at those golden unicorns makes me smile no matter what Gem is doing. Being Creepy or Being Nice? ?